Fixed crashes related to projectiles in battles - the game should now be relatively stable. Fixed AI capital ships standing in front of each other outside firing range, forever. This patch introduces military land bases and gimbal weapons / auto-turrets. Unfortunately it also seems a lot more unstable, so expect a patchfix soon ! 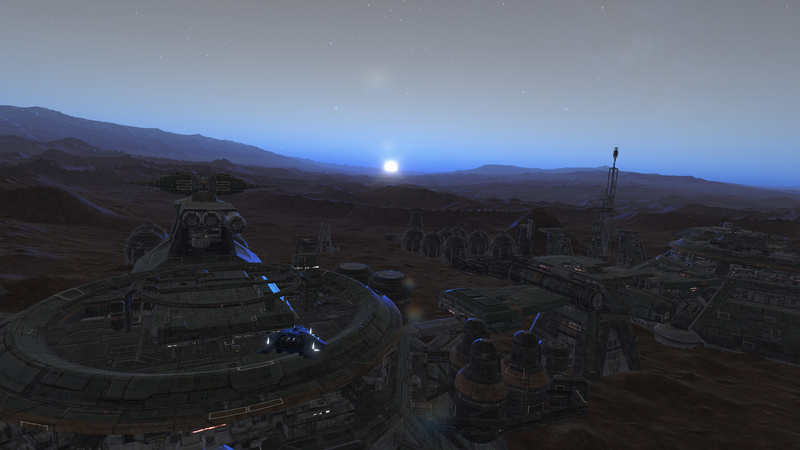 Land bases have been added, they’re now available in various locations around planets / moons of Rethe Prime. They’re all called “Factor 1” in game - forgot to set the name properly. They’re also lacking a polish pass on their properties, will do that later this week. However one downside is that for gimbal weapons, like on the interceptor, it’s no longer possible to aim at an offset from the center of the target (especially if that target is huge on screen), the weapon will not fire. While this is not a bug, this is only a temporary effect, and will get addressed in a future update. Added energy cooldown for NPC AI bots, they should no longer fire without ever running out of energy. They’re still pretty bruttal (especially in this patch with the gimbal weapons), so difficulity will probably be reviewed soon too. Indicator bleep in/out sounds only happen when the actor is within a 1000 Km radius now. No more bleep spam from battles a million Kms away. Since all ships are now much more effective at killing / focusing an enemy, balance is totally off. Ships will probably get a huge boost in survivability later this week. New explosion effect: replace the old “fire” explosion with the Kickstarter’s plasma explosion. It looks a bit too dim, and pretty ugly for large explosions / capital ships. Need more feedback from players. Updates to AI commander, now sending multiple scout ships at once if has enough credits. Revamped credits timing a bit too. Fixed some forgotten experimental code that disabled entities rejection in the distance when too small on screen. This optimization is now back in. 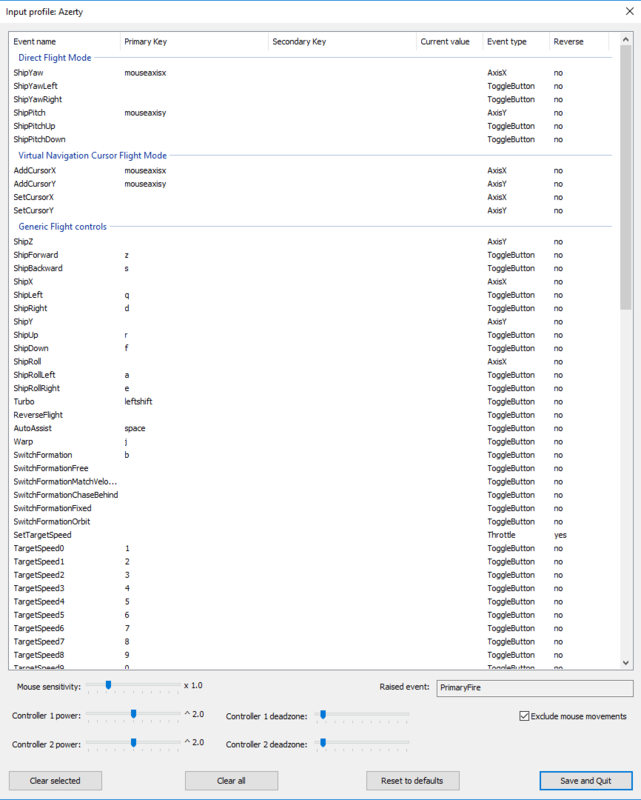 Fixed incorrect selection targetting (using hidden mouse cursor) in direct control scheme. Now uses ship center. Still it would be helpful if a couple people could download this patch and test that the crashes from the previous version have disappeared, prior to making the game public tomorrow. They typically happened when players were in close range and selecting targets ( NPCs or players ), especially related to this target dies. As usual, if you experience any crash, please report to the forums with the entire log file, thank you ! Massive bandwidth optimizations. I realized recently that static actors ( planets, bases, stations… ) generated as much bandwidth as dynamic actors like ships. This should now be fixed. In theory if you’re alone you should experience around 1 to 2 KB of download bandwidth. Optimized error correction. Server snapshots validation rate has been reduced, which further reduced bandwidth. Client only applies error correction to the latest server snapshot, which could in some scenarios prevent the client from falling into a freeze. Added caching for actors. This increases the loading time, but should prevent the multiple-seconds freezes when coming in range of a point of interest. Note that it uses a lot more video-ram. I enabled mesh/textures caching only in video quality ( set in the launcher settings dialog ) High and Extreme. Physics caching does not consume video-ram, therefore it is always enabled. Optimized collisions on the server side, which should reduce a bit the load and prevent it from “teleporting” players around when exceeding its cpu limits. Replace “blood frame” texture ( when hit by an enemy ) with a smoother version. Added energy recharge rate setting. Previously it was a constant always set to 5% of the max energy points. It is now tweakable per ship. Added tactical behavior to bots AI. They can now alternate between three modes: “keep distance from target” ( this was the only one in previous versions ), “cross and turn around”, and “flee from target” ( happens when the bot is low on hitpoints and shields ). Reverted Interceptor to fixed weapon with no gimbal. Added 50% more energy to interceptor. Also added a fair amount of energy to bomber and corvette. 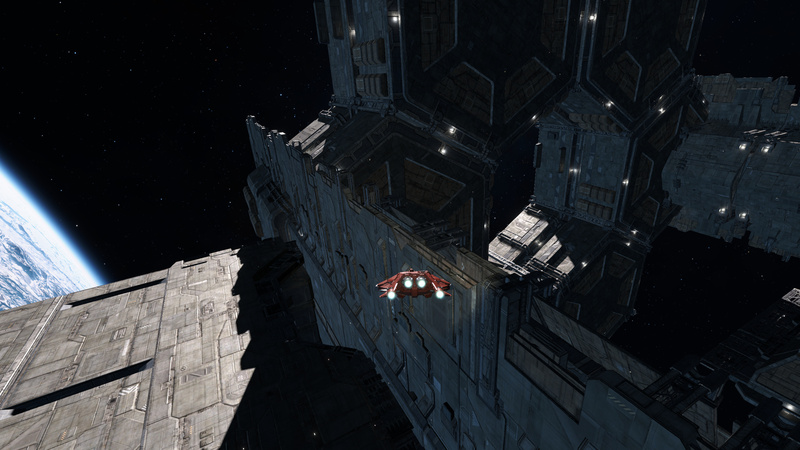 Added more hitpoints and shields to corvette and capital ships, increasing their survivability. 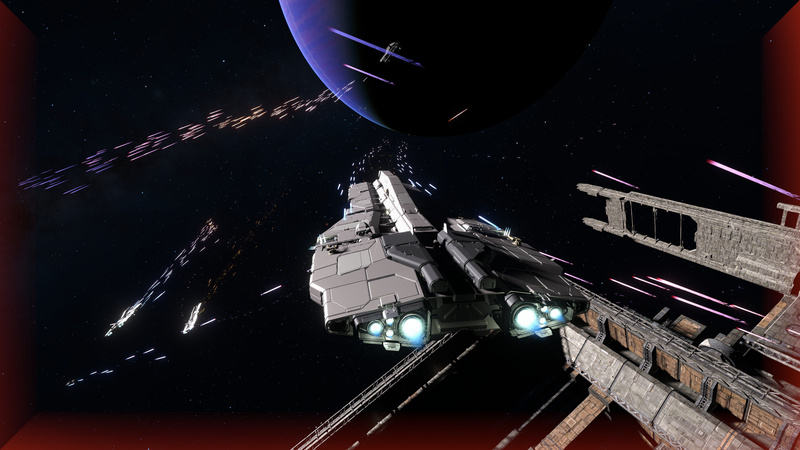 Tweaked some weapons stats; light turrets ( on capital ships ) have a faster projectile speed. Reduced energy consumption on corvette turrets. Adjusted firing cone limitation for all weapons and for AI. Fixed a small issue that prevented the “closest” ( key: G ) selection to work as intended. I still need to do quite a bit of work on this, as it should select in priority the target that’s the largest threat and not necessarily the absolute nearest. But that will come later. Updated the embedded chromium we use for web login. This seems to fix the problem with 2-factor Google logins that use SMS. It also fixes a number of other issues. The alpha play-test week-end is starting today 10 November at 20:00 GMT and will end around the same time on Monday 13 November. Pease keep in mind we’re still in pre-alpha and that you might encounter technical issues, framerate drop or server crashes. We’ll be working diligently all week-end long in order to address these issues are they come. For in-game issues, crash reports or gameplay feedback, feel free to contact INovaeFlavien by PM on the forums. Thanks everybody for your participation and support. We hope you’ll enjoy this test week-end and look forward to hearing from you ! 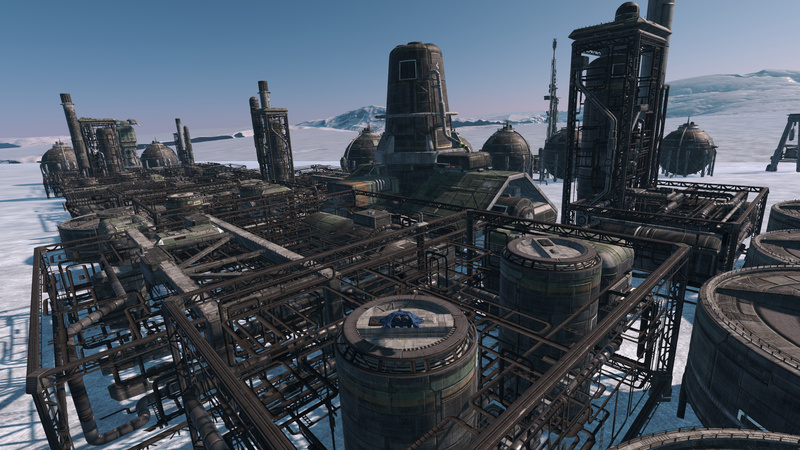 This patch introduces factories on various planets. At the moment there’s only 3 layouts, located on Sarake (Earth-like planet), Aresthia (Mars-like planet) and Semnoz (Ice planet). … therefore, this patch note will simply be a summary. Added world-space location to camera vibration effects - now the camera only vibrates when close to the vibration source. This also fixed the crazy vibrations when firing weapons in third-person mode. This patch iterates on the previously released major version 0.2.5.0 which introduced the new weapons system. Modified missiles behavior: will now enter detonation mode within a threshold distance, no longer related to a timer. The missile will try to close the distance to the target but if that distance starts to increase the missile explodes. Added critical hit for weapons systems - these can now be broken like other ships systems. Will repair automatically over time. Made angular thrust and turn rates more asymmetric on most ships besides the interceptor. Pitch is now slightly stronger and yaw slightly weaker. Finally, one of our artists, Dan Hutchings, will be streaming in our youtube channel ( https://youtu.be/bZwKAE1OZkk ). 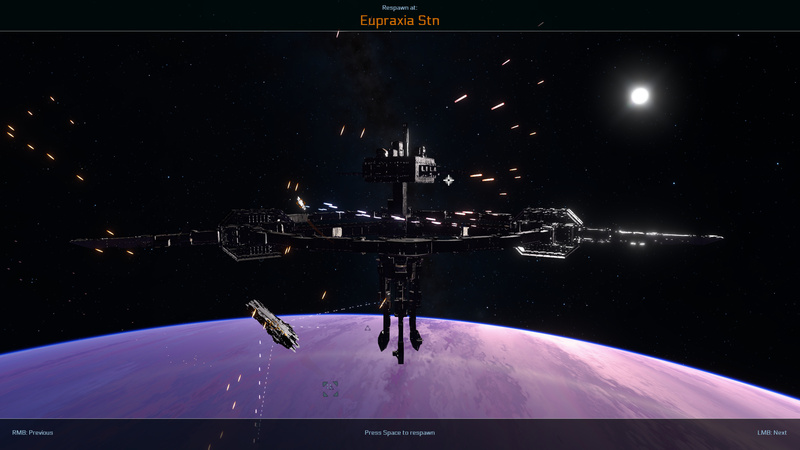 And remember, this is a pre-alpha, so it still looks bare-bones (untextured ships, placeholder effects…). Expect issues, but most importantly: have fun ! This patch introduces many performance tweaks, AI improvements (especially related to planetary battles) and new battle locations. Also includes many tweaks to warp mechanics to make it more reliable / easy to activate. Revamped target attack priorities / threat levels for AI. This should change the flow of battles quite a lot. This new patch includes a couple of quality fixes for planets and projectile effects, as well as massive improvements to the input system, including better support for controllers and HOTAS. Tweaked angular accelerations on the smaller ships. The main change is a reduction of angular acceleration on the interceptor to give some momentum to turning. The bomber and corvette are also affected in a smaller way. Increased survivability of all ships: small shields boost on bomber, medium boost on corvette and huge armor/shields increase for capital ships (up to +50% for cruiser/carrier). Fix for players not showing up in exploration mode: the “player” indicator was accidentaly switched between exploration versus combat modes. Added/moved deadzones/curve power settings for both controllers to the input mapper editor. Same for mouse sensitivity. Revamped default settings to be more coherent. Also added SetViewYaw/Pitch events to set the absolute camera-view angle. This should be helpful for TrackIR users. Improved the key detection mecahnism. Added a 5 seconds timer to hitting a key. Added filtering by event types/keys to the detection mechanism. You can’t input an axis into a ToggleButton for example. and change the navigation cursor sensitivity instead. Note: to be clear, planets were NOT rendered twice. They were generated twice (which has a performance cost, but not in terms of average framerate). Introduced an experimental tweak to projectiles particles to provide some cheap anti-aliasing. Particles in the distance should also preserve their brightness longer now. 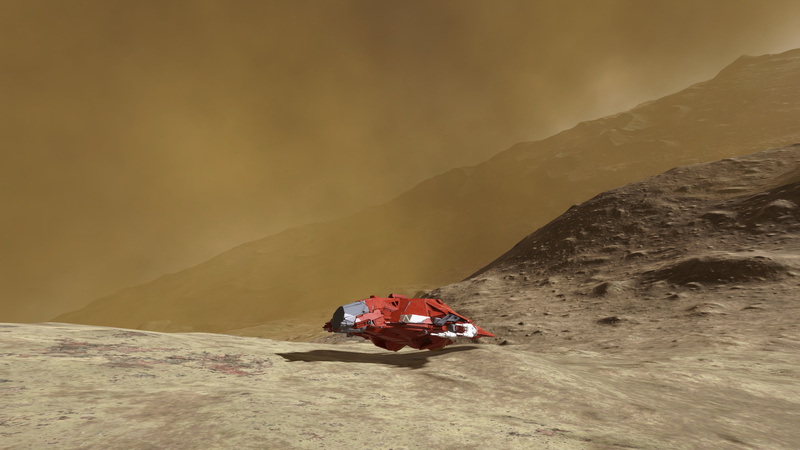 Implemented planetary terrain quality settings. Planets tesselation should be higher around ground level in high or extreme quality mode. The planet should also retain a higher tesselation from space. PvE Raid Boss spotted in Infinity: Battlescape! 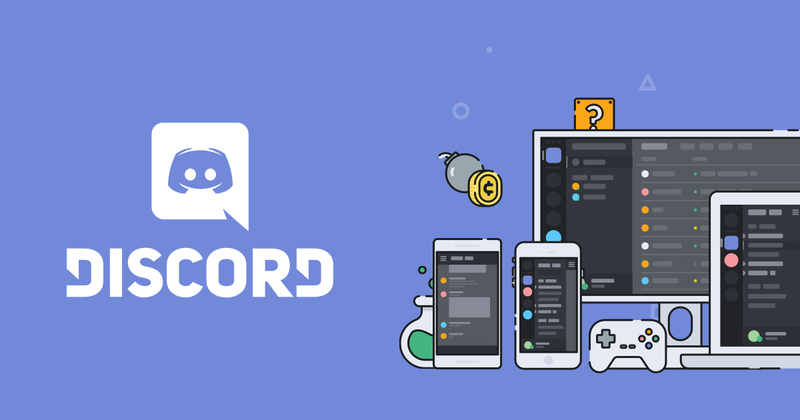 An important patch that addresses a long-time issue with networking interpolation and error-correction smoothing and which was made more noticeable in the form of rubberbanding since patch 0.2.6.0. This patch also includes some new gameplay experimental changes. Implemented an automatic throttle option. It is disabled by default. It can be enabled in the launcher settings dialog. In this mode, manual forward/backward thrust (W/S) sets the target speed to the current speed. the automatic throttle, we recommend that you copy/paste them with double-tap=true from the official xml file into your user/documents file. You can assign them to forward/backward thrust (W/S) as double-tap. This new patch is an important step towards releasing the alpha, as it introduced the spectator game mode and various game states which currently act as placeholder (such as the main menu). 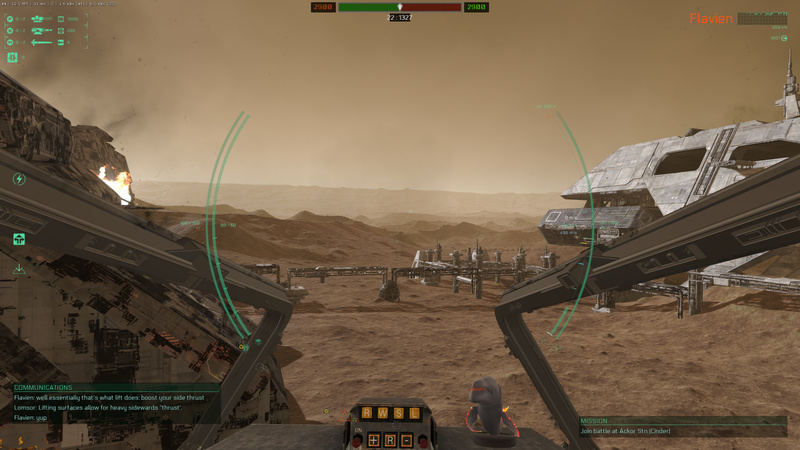 There are also tweaks for the HUD and various sytems. Introduced the spawn menu. Currently is is showing your team bases at which you can respawn at. If a base does not have a spawn point, it will not be shown. Bases can be cycled (default bindings are left/right mouse buttons). You’ll respawn at the currently selected base. current implementation is a placeholder until after the alpha is released. Introduced a kill-cam feature. The view switches to the ship that killed you a few seconds before you explode. After 10 seconds, it automatically switches to one of your ally’s viewpoint. Just like in the spawn menu, you can cycle through ship allies. This mode only cycles through ships that are in the current battle zone (it will not cycle to a ship that is thousands of Kms away for example). during that time and will continue to fly through its current course. If you get killed while observing another actor, the spectator mode will be interrupted and you’ll be back to the spawn menu. in low quality will this texture change to 1024x1024. target is out of view/range. Reduced rejection size for weapons geometry. This should allow to see weapons/hardpoints from a higher distance before they’re getting culled. The change affects all graphical settings. This patch introduces counter-measures ( chaffs ) for small/medium ships ( up to destroyer ) as well as some bug fixes. Added a server side command /SetInputBufferSize <value:0 to 10> to change the input buffer size. Default is 2. Lower values might reduce input lag but cause issues with ping variations. If you experience high ping fluctuations and see a lot of error corrections as a result (yellow icon on the bottom-left corner of the HUD), you might want to try increasing this value to 3 or 4 as an experiment. Please let me know if you have any trouble with this value. Please keep in mind that we’ve barely reached the alpha stage. The game lacks proper menus, UI, feedback/mission objectives and assets are still untextured or placeholder. We will be iterating on the gameplay features and balance from now on. Most importantly, even if the game is barebone we are hoping that you’ll have fun and see the potential. If you feel we are going in the wrong direction, do not hesitate to post your feedback on the forums. See you in game and good luck ! permanently detected, they have to be scouted. To do that, a member of the team has to stay within a short range of the target (5-10 Km) and fly at low speed for 30s to one minute without dying. A scouting progress bar will charge up. Scouting enemy installations provides credits. Note that detection is shared amongst all members of the team, so if you see an enemy ship or installation, everybody else on your team can, too. point the installation is considered permanently destroyed and will change team to neutral. Warp has been revamped. It now uses a nearby mass limitation system and will automatically adjust its maximum warp speed based on the distance to the massive bodies. Warp physics should feel more natural and navigation through the star system a lot easier for beginners. It is still possible to set the target warp speed to lower values manually, or to override the limit to warp faster. However after a certain limit above the warp speed, the ship might get damaged due to micrometeorites/space debris. will dim lighting to the point the star is as small as other stars in the background and direct light cannot be seen anymore with the naked eye. This patch is mostly a “quality of life” patch for the alpha. 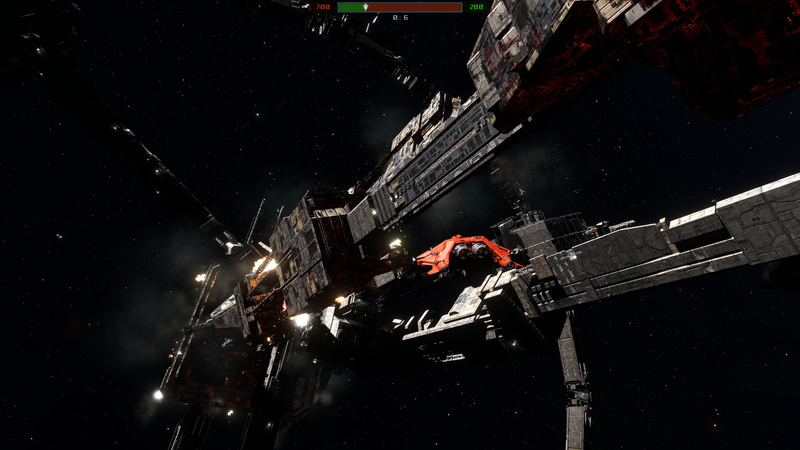 It includes various crash bug fixes, Direct Mode flight control fixes, a new small Battlescape (with two giant asteroid bases) for shorter matches and a number of balance adjustments. 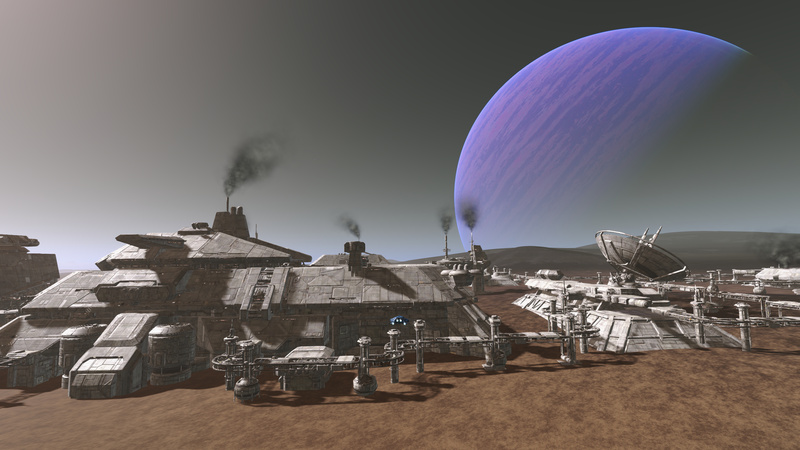 This is the “haulers” patch, which revamps the resource generation side of the game by introducing haulers that fly between factories and stations to turn their resources into team credits. As usual, this is a first implementation which will probably introduce a fair number of small bugs, please do not hesitate to report them on our forums. Of particular interest is watching the behavior of haulers and checking that they have no trouble ferrying resources along their path. If you notice any funny behavior, we would be interested in a description of the behavior and some screenshots. In the previous versions, factories generated credits every few minutes. The amount of generated credits depended on the factory category (small, medium, large) and the amount of tank storages destroyed or alive in the factory. In the new system, a hauler spawns every 5 minutes at each factory hangar. An algorithm decides a destination installation which will typically be one of the space stations in orbit of the same planet. 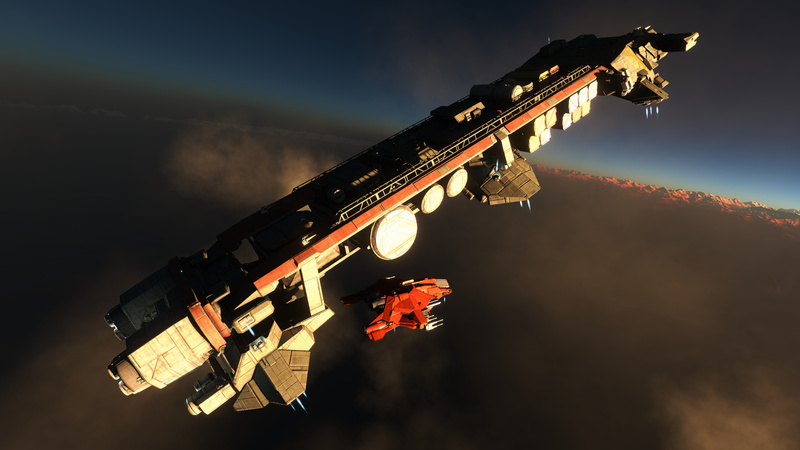 The same station will be chosen all the times a hauler spawns, until that station gets destroyed, at which point the algorithm will switch to another station. Haulers follow the same path, slowly taking off from the surface, accelerating to reach low orbit then jump into warp. They’ll exit warp a dozen kilometers away from the destination station, then transition to docking mode and will disappear once docked, turning their ferried resources into team credits. Team credits then get split amongst players and AIs as previously, preferring players over AI when the player count is sufficient. When flying along their course in warp, haulers will stay in orbit around the planet and fly at 50 km/sec. Since it is not possible to attack when in warp, we’ve introduced a “warp jam” equipment, currently available on corvettes and destroyers. To use them, you need to be in warp yourself, closely following the hauler (< 20 Km away from it) at the same speed of 50 km/sec. To activate warp, open the ship system menu wheel (default: V) and select “Warp Jam”. It will generate a bubble around your ship, which will force out of warp any ship within the bubble (of radius 20 Km). The cooldown is 30 seconds. Warp on affected ships will stay down for the same amount of time. Another change is the introducion of manual firing towards the mouse cursor for capital ships MK1 and MK2 weapons. 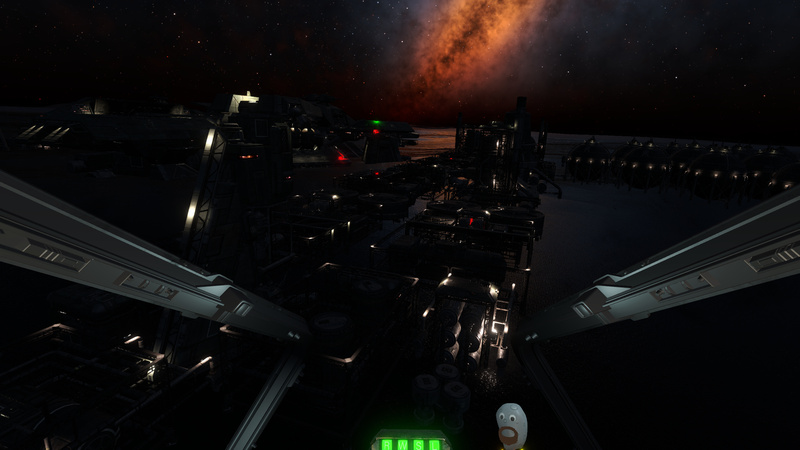 Smaller weapons still aim at enemy ships automatically. The goal here is to introduce player skill to capital ships (rather than the more passive select-hold-fire-and-wait). Feedback on this new mode is also welcome. This new patch introduces spawning at carriers and update the repair/resupply mechanics available on corvettes and at spawns. Welcome to the Infinity: Battlescape beta week-end. We would like to remind you that the game is still in alpha (beta backers only have access this week-end) with full beta scheduled for early 2019.
iterating both on the visual effects and gameplay in the coming months. Although the current version is rough around the edges, we sincerely hope that you will like what we are trying to achieve and have fun. the gameplay. We hope to see you in game ! Tweaked splash damage formula for missiles / torpedoes. The old formula used a too soft ramp, resulting in heavy damage (>50%) even at max splash radius ! Torpedo tweaks: increased acceleration, so that a torpedo has a bit of auto-aiming and becomes useful against heavy moving targets like capital ships. If lucky it is even possible to hit smaller ships like a corvette. Revamped and massively increased shield recharge rate on all ships. The interceptor shields in particular, now recharges in a minute (or 24 seconds with shields overcharge). Capital ships recharge almost ten times faster, making it impossible for light-damage ships like a lonely interceptor to out-pace the shield recharge rate. Experimental revamp of credits redistribution to AI commander. Instead of using a global pool, the AI commander now splits its credits according to the strategical score of each potential objective. Once a certain threshold is reached (per objective), a battle is triggered.